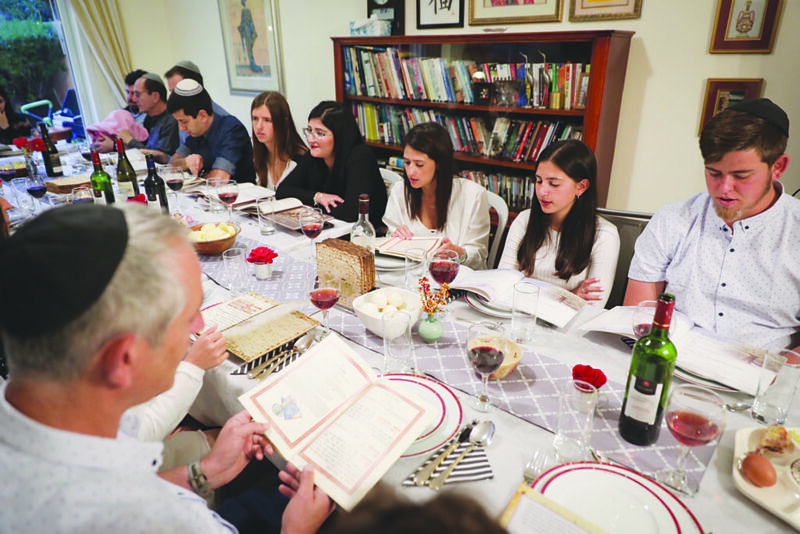 An Israeli family seen during the “passover seder” on the first night of the 8-day long Jewish holiday of Passover, in Rishon le Tzion. March 30 2018. Photo By Nati Shohat/flash 90. (Kveller via JTA) — No joke: I love hosting the Passover Seder. I love feeding people — I’m both Jewish and Southern, so this is deeply engrained in me. I love educating people, and I love being Jewish, so the Seder is a perfect opportunity to gather the ones I love for a meal — a meal during which they are actually open to me sharing all sorts of fun facts, songs and stories. Having your guests concoct their own charoset is so much fun. On a side table in our dining room, I set up an array of diced fruits, nuts and a selection of honeys, wines and juices. (Pro tip: Martinelli’s makes the best apple juice!) I put out cheap, reusable plastic shot glasses so guests can make multiple variations to find their favorite. Sometimes a few of the grown-ups make a concoction that much more closely resembles sangria than charoset, but hey, that’s part of the fun! I love doing this for several reasons. I can personalize the presentation and I can make changes up to the last minute. I’ll assign readings by writing a person’s name, add images of the people who are attending (I can add even add photos from previous years’ Seders, which is particularly fun since we have little kids who have grown a lot in the last year). It’s a multimedia presentation: We play a video about The Four Sons instead of reading that passage; we’ll sing along with the Maccabeats’ version of “Dayenu.” Plus, no one is ever on the wrong page, and everyone is looking up and around instead of down. Though we follow the Haggadah, we frequently pause to share parts of the story using picture books. It doesn’t seem to matter that there are usually more adults than kids at my Seder; everyone welcomes the change of pace. We like to say the Four Questions all together, reading from an awesome picture book that’s in both English and Hebrew, and we read “The Longest Night” to help us imagine the experiences of the enslaved people. We also have several copies of the “Dayenu” board book (thanks PJ Library! ), so we have multiple people holding onto it as we sing it in English (just before we watch the video mentioned above). I love shtick. But what I don’t love are some of the more popular ways to work it into the Seder. (Take those Ten Plagues finger puppets — the plagues weren’t cute, so let’s drop those, OK?) There are myriad other ways for putting some pep into the Seder. For example, we like to put the kids in laundry baskets — we give them a ride around the table when we talk about baby Moses in a basket (we do it while singing “Little Taste of Torah”). Emily Aronoff Teck is a multitasking mom, musician and educator. “Miss” Emily visits Jewish communities to share celebrations and songs with young children and their grown-ups, and manages JewishLearningMatters.com. She earned her doctorate in education in 2018 at Gratz College.